These stones are slices of natural opal glued to a solid ironstone backing. 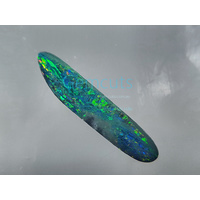 Adhering the slice of opal to an ironstone backing causes the colour to become much darker and more vibrant and gives it the appearance of a solid boulder opal. If a doublet is set into jewellery with the sides covered, it is extremely difficult, even for an expert, to tell whether it is a doublet or a solid opal. 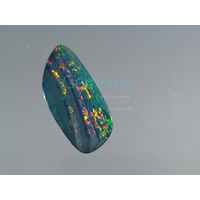 Since the top of the stone consists of pure opal, it therefore appears exactly like a boulder opal, and so doublets have a very natural appearance. Opal doublets can be a fantastic alternative to solid stones as they are much cheaper than solid boulder opals. 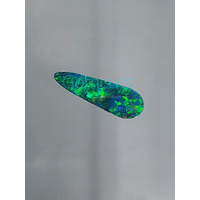 Solid opals with the same appearance as an opal triplet can be ten times the price as they are rare and valuable, therefore they serve a useful purpose in making beautiful boulder opals affordable. In the past there were issues with water incursion into the layer between the opal and the backing. Modern adhesives have largely fixed this problem. Getting your opal doublet jewellery wet for a short period will not harm it. However prolonged exposure to water is not recommended.